techJOYnT Education Foundation has announced that they will be hosting their very own Game Design Summit competition for the South/Southwest region. Students, as individuals or in teams, will have 6 months to come up with an idea, create a game, and submit it through the techJOYnT website for review. Video game design is one of the best ways to learn all of the STEM tracks simultaneously. techJOYnT Education Foundation has announced that they will be hosting their very own Game Design Summit competition for the South/Southwest region. Students from Oklahoma, Texas, Arkansas, Louisiana, New Mexico, or Arizona in grades K-College (up to age 27) are eligible to register. Each year, techJOYnT Education Foundation (TEF) releases a main theme and the individual age groups get their own sub-theme during the start of the competition. This year’s main theme is Ocean Conservation and the release of the sub-themes will be on February 1st, 2014. Students, as individuals or in teams, will have 6 months to come up with an idea, create a game, and submit it through the techJOYnT website for review. In July of 2014, there will be an award ceremony held at Oklahoma City Community College. Students who are able to attend will get the opportunity to show off their games and play all of the games submitted by other students and teams. 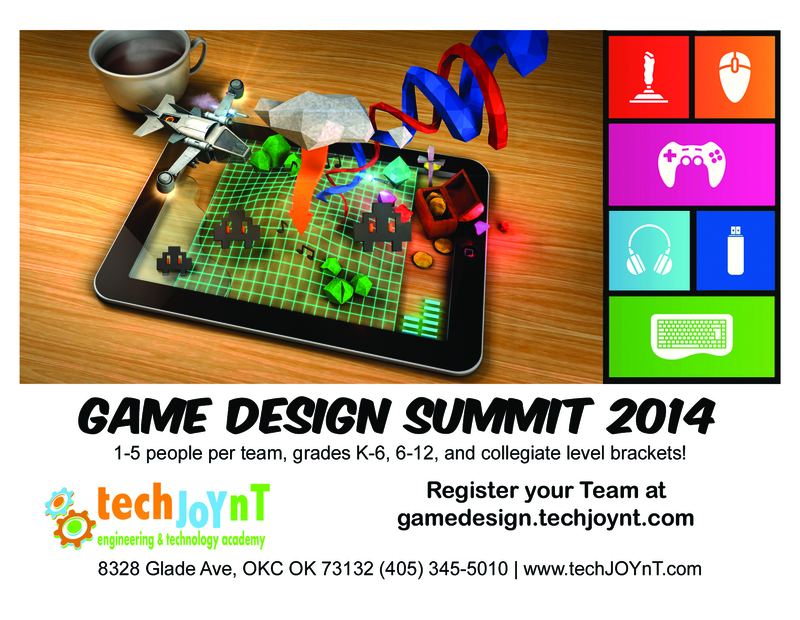 The Game Design Summit will also include a few vendors and booths of sponsors of the event. The participating students will be able to use Open Source software platforms to make their games. 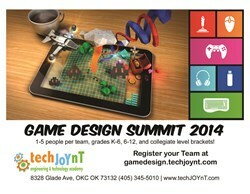 techJOYnT Education Foundation’s website for the Game Design Summit has a list of available platforms to use as well as a Frequently Asked Questions section. Prizes and awards are still To Be Announced, but you can stay posted on regular updates at their website. You can register for the event here. techJOYnT Education Foundation (TEF) connects young minds with hands-on science, technology, engineering, and math (S.T.E.M.) learning resources in the greater Oklahoma City communities. TEF offers K-12 students a unique experience that enables them to become creative problem solvers and future science and technology leaders. TEF, an Oklahoma non-profit, has promoted STEM Education over the last 2 years by organizing several informational seminars and events. TEF has worked closely with other community-based organizations such as State Fair, KIPR Robotics, TedxOU, OEF Engineering Fair, Dell Youth Connect, Oklahoma FIRST, Greater Grads Career Fair, Rose State College, Police Athletic League, Oklahoma Science Museum, and many more.